In 2007, I wrote an article on LED lighting for stage and theatrical use as it was fast becoming cheap and more readily available. Major stage lighting manufacturers had started to dive into the LED lighting fixture market while cheap imported lights mean that even a small band or DJ could get a slice of the action. On Stage Lighting has a updated quick guide for anyone thinking of buying and using LED stage lighting in 2017. Well, while we are all recovering from the fact that On Stage Lighting is actually ten years old in October this year….. Let’s review the state of LED in stage lighting today in context with that article. Much of it still holds true, but there have been major developments. Low Power Consumption – Because the LED uses a fraction of the power of an normal lightbulb (lamp), the power consumption of LED lighting fixtures is very small, meaning you can use a lot of fixtures on small power supply such as a 13A domestic socket. This is great for small band lighting rigs and the disco/party DJ. Low Heat Radiation – Although LED stage lighting does produce heat, the fixtures produce light without getting extremely hot. Modern stage lighting lamps produce more heat (and light) than they ever have and this has been coupled with improved lantern casings to minimise the risk of burning the operator. There are, however, some environments where the low heat properties of LED stage lighting are desirable. LEDs still use relatively low power compared to what might be considered the ’traditional’ equivalent of an incandescent or discharge light source. However, as brightness and colour functionality has increased you can’t assume that LED stage lights require no power at all – what you can be sure of is that you usually get a hell of a lot more lighting fixtures onto your power supply. There is one caveat to this and that is the way that the power supplies of LED units leak to earth can build up with a lot of fixtures, causing RCDs to trip out. This is usually only an issue with a large number of fixtures running through a single RCD rating of 30 mA. LEDs are still highly power efficient. As with power, LEDs are still more heat efficient than their traditional counterparts. With some of the really high brightness, monster LED stage lights around these days this doesn’t mean they run stone cold. Most LED fixtures have some form of cooling system, but they generally rely less on noisy fans than the discharge lights of the past. In the last ten years, it is probably colour that has seen the most development in LED based stage lighting systems. While LEDs are still by no means a perfect light source when it comes to the visible light spectrum, manufacturers have pushed technological developments along in an effort to make LED based stage lighting fixtures a more useful source of both strong and pastel colours. This has included the use of more colours than the traditional Red, Green and Blue LEDs to include things such as White, Amber, Warm White, Cool White and, in the case of the ETC 7-colour system, a bunch of others. There are still some technical limitations to the way that LEDs produce visible light, but overall the range of uses for LEDs in stage lighting is now much wider than it once was. This has lead to all-LED lighting rigs, but best not to get into a discussion with a Lighting Designer about that if you are in a hurry. Outside of the visible light spectrum, some LED stage lights also sport Ultra Violet (UV) emitters as part of their colour armoury. For my money, the UV LEDs still aren’t a patch on an old fashioned UV canon or even UV striplight as they produce too many light waves in the visible violet spectrum and this can wash out the ‘blacklight’ effect. However, it’s an option. Not only are LEDs lightweight and compact, but in the last ten years many manufacturers have produced LED based moving lights that are generally faster and quieter than their ‘old skool’ moving light counterparts. In the last ten years, LED technology and the associated optical systems has really pushed the brightness and punch of LED based stage lights to new heights. This, along with the developments in colour, have made LEDs a common light source in all kinds of situations and not just the few ‘splodge a bit of colour about’ situations that they used to be. So, What Types of LED Lighting Fixture Might I Choose? For the purposes of stage lighting, the RGB colour mixing (see above) capabilities of the LED fixtue is it’s selling point. The main forms are in a lighting batten, a long strip with an array of red, green and blue LEDs or in a compact array that produces a beam of light, similar to a conventional PAR can or a Floodlight. The batten are useful for lighting up flat areas, such as a wall or backcloth, while the PAR / Flood fixtures will give you a beam of light, similar to their conventional stage lighting relatives. Moving Light technology has also joined the LED bandwagon, with LED arrays being packaged in all shapes and sizes of “waggly” LED Moving Head fixtures. Another stage and theatrical use for the LED is in a large, screen-like array which can be used to show colours, patterns and moving images like a low resolution television screen. One thing that has really come a long way in the last ten years is the range of light ‘types’ that LEDs are fitted to. Originally simple PARs and Flood type fixtures, the optical systems have made all kinds of beam and projecting spotlights possible. While it doesn’t seem too long ago that early production LED ‘profile’ spots were being show, this is an area where many more examples of this can now be found and are being specified for install into venues around the world. The optical technology has also given rise to a much wider range of LED based moving lights available to markets at all price points. 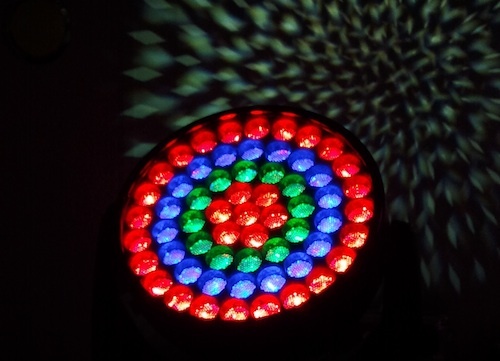 How Do I Control My LED Stage Lighting? Stage lighting is usually controlled using the standard DMX512 protocol, and LED fixtures are no exception. Different DMX channels control the Red, Green, Blue while other channels may deal with overall instensity or special chases and effects. The LED lights are linked to the DMX signal chain in the same way as other intelligent stage lighting fixtures and do not require extra dimmers to control them. If you don’t have a DMX lighting controller, many LED stage lighting units can be used in “standalone” mode or can have control locally, using a simple controller/power supply that enable you to change the colour and run simple effects. One development that was in it’s infancy around 2007 was the combination of battery power and wireless DMX systems. This allowed low power LED fixtures to be completely wire-free and while cable-based power and control systems are still used in the majority of stage applications, the available and use of battery/WiFi LED stage lighting has greatly increased. What’s the catch about LED stage lights , then? LED stage lighting is cheaper than ever, uses less power, is smaller and doesn’t get hot. It also offers you a range of light colours, without using lighting gels. What more do you want? LED arrays can’t “focus up” like a conventional lantern. Because there are many sources of light in the fixture, you can’t get a sharp spotlight or project a gobo using an LED fixture. ** See above. This has been overcome. The “endless” colour choices have limits. Different LED stage lights have various colours that they just “don’t do”. A good quality white light is one of them. Because of the way that all three colours (RGB) are mixed, a good even white light is near impossible to achieve with most fixtures. ** Colour systems are better than ever. LED lighting fixtures are bright – but not that bright. Although power for intensity-wise LED stage lighting fixtures are really efficient, they do lack the punch of their conventional lantern relatives (for the moment). A PAR can with LEDs in it is nowhere near as punchy as a PAR64 CP62 (or even a PAR56, for that matter). ** Brightness and punch has improved. Intensity drops off quicker over distance. Or at least , it appears to. Because most LED lighting units have neither a lens nor a reflector, the light they produce scatters and struggles to maintain intensity when thrown much of a distance. ** See above, some good optical systems are available. Colour mixes better over distance(?). Because the three coloured LEDs need to mix on a surface to create an even light, this mix improves further away from the light source. This produces the dichotomy of a fixture that colours mixes well when it is too far way to maintain a good intensity. ** Optical systems are much better. You get what you pay for. All LED stage lighting fixtures are not the same. Even though you can buy them cheap doesn’t mean that you should and all of the above points are more apparent in cheap LED lighting fixtures. A good quality lighting manufacturer will always be more expensive but, in general, the quality of the light and fixture will be far superior. ** Kit is generally coming down in price in relation to functionality / quality. However, you still get what you pay for. While having their faults and limitations, DMX controlled LED lighting fixtures are still an important development in the techonology of stage and theatre lighting. They expand the armoury of the lighting designer and will help save the planet – a bit. What if I need to buy LED stage lighting kit? These days, LED stage lighting technology seems to be everywhere. Every school or drama club has either already added LED based stage lights to their stock, or is looking to. This leaves the novice with difficult choices in specifying, let alone using this lighting equipment. It’s difficult to know which LED fixtures are going to work in your space and for your specific needs. Once you have this kit, it also usually requires some additional learning on DMX lighting control systems and other considerations such as colour mixing. This is an area that I often work with school and drama groups on through workshops and also to other parts of the world via my online training courses. If you’d like to learn more about the either the creative uses of modern LED stage lighting or the technical details of controlling them, you should join my Guest List and get access to specialist knowledge and help. If you have any thoughts about current trends in LEDs for stage lighting purposes then feel free to put them in the comments box below. Although you are not alone in this respect one very important point you fail to mention is the potential danger to eyesight presnted by these high intensity LEDS. Many instruction manuals warn against looking directly into the light which in serious cases can result in permanent blindness. I fear it won’t be much longer before the no win no fee lawyers wake up to this. I am a Drama teacher and have been asked to design the lighting rig for a black box – feel a little out of my depth. There is pressure on me to not have three phase in the theatre and to only use 12 lighting bars. Do you think a modern black box theatre (12 metres by 19 metres) should dispose of three phase and focus only on LED lighting? What advise would you give an (amateur) theatre designer?!?! I assume by ‘three phase’ they mean large electrical supplies – most electrical installations above a certain size contain multiple phases. Also, while a lot of LED kit will use less power per unit than traditional equipment, they still need powering and a theatre will require a good number of fixtures. If the management are keen on using less electricity and avoiding incandescent fixtures then make sure you get a good number of the best LED fixtures you can afford such as ETC and consider ones that do warm white rather than assuming that you can get a good face light look from mixing RBG or RBGA. You can easily supplement these with cheaper static or moving LED wash lights for colour washes etc.